Champix is a licensed medication that has been designed to help you quit smoking. It contains the active ingredient, varenicline and is only available on prescription. Unlike Nicotine Replacement Therapy (such as nicotine gum or patches), Champix doesn’t contain any nicotine, but works to reduce cravings and nicotine withdrawal effects. It also works by making smoking less enjoyable. When you smoke and inhale a puff from a cigarette, nicotine enters your brain and binds to nicotine receptors. This triggers a release of the “feel-good” chemical, dopamine. This short release of dopamine is what makes smoking pleasurable and is responsible for smoking addiction. After a short while, nicotine and dopamine levels begin to drop, making you crave a cigarette. 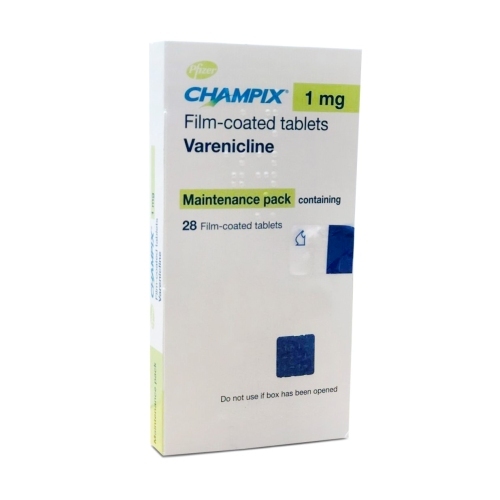 Varenicline, the active ingredient in Champix, works by sitting inside the nicotine receptors. This means that nicotine from cigarettes are unable to attach and activate these receptors. A burst of dopamine (the feel good chemical) is no longer released when you inhale a cigarette and smoking becomes pointless. Along with making smoking less enjoyable, varenicline also helps to cut cravings and reduce the withdrawal effects by sitting in the nicotine receptors and partly stimulating them. Set yourself a quit date (between day 8-14 of treatment) so that you are mentally prepared to give up smoking for food. For the first week, you will be taking a lower dose of Champix, to allow your body to get used to it. Do I need to take Champix for the full 12-week course? It is important to take Champix for the full 12-week course. This time frame allows you to gain the full benefit of treatments, reducing your chances of picking up a cigarette again. Champix is not suitable for use in pregnant or breastfeeding women. Animal studies have shown Champix to have toxicity in pregnancy. Champix was also found to be present in milk during animal studies. Whilst it may be the case that smoking would cause more harm to the foetus during pregnancy than Champix would, Nicotine Replacement Therapy generally seems to be the preferred option. This is a discussion that you could have with your doctor or midwife. Unfortunately, we are unable to provide Champix to breastfeeding or pregnant women. Can I still smoke whilst taking Champix? Yes. You are encouraged to smoke up until the quit date. This allows you to mentally prepare to finally give up smoking for good. Many users also advise that smoking becomes less pleasurable and can often cause you to feel nauseas. This may also be beneficial in the fight to give up smoking. Once you have read all the information surrounding Champix, including The Patient Information Leaflet, and you are fully committed and determined to quit smoking, choose the correct options (starter pack for however long you want to buy treatment for) and fill out the online questionnaire to determine your suitability for Champix. For returning customers who have already started treatment, you can buy the continuation pack. For help and support, please contact us.